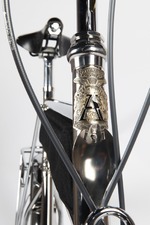 Spork Head Tube BadgeThe frame and fork are made from KVA stainless steel. The split-plate fork crown is made from laser cut stainless. 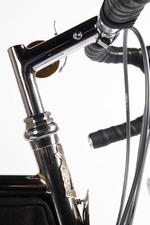 The racks and stem are made from chromoly steel, and were polished and chromed. 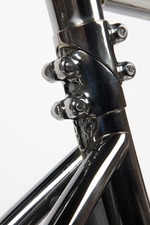 The frame is a breakaway style, with a coupler on the down tube, and a breakaway point on the seat tube. The seat post is integral to the structure of this system, which is brilliant and simple (No, I didn't invent this. Neither did Tom Ritchey -- it came from way further back than even his design). The seat stays come in below the seat tube breaking point, and the rear rack stays attach higher up on the seat tube, where seat stays would normally be. 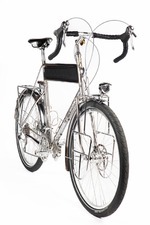 This gives the bike the appearance of having a traditional rear triangle, and serves to support the rear rack. Front Rack & LightThe front rack has an upper deck that can be used intependantly of the low riders, which are detachable. The rack supports the fender and the front light. The rear rack has an integrated u-lock holder. Notice the leather sleeve on the lock shackle. This was made by Dirt Jr., right here in Portland. I plan to put these up for sale on my website soon. They look so much nicer than what comes with the lock. We're working on a vegan option as well. Rear Rack & Lock HolderThe frame uses traditional tubing dimensions (1" top tube; 1 1/8" down & seat tubes), and has a straight truss, or second, top tube. This supports the head tube and seat tube, stabilizing the ride for weight bearing, particularly when the bike is fully loaded with bags. The space between the two top tubes was an ideal place to add storage, and the frame bag was custom made by Black Star Bags here in Portland. There's enough capacity in this bag to carry a couple of tubes, maybe even a folding tire, tire levers, patches, a multi-tool, energy bars, phone, etc. Stainless LogoThe down tube logo is also stainless steel, laser cut and brazed on. It took three of us to keep it set while brazing. Next time, I need to video record the process. I left the panel around the logo exactly as it looks right after brazing, without polish. That gives it the burnt, dirty look, which really stands out nicely. Part of the reason I built this bike was because I hadn't yet seen a really utilitarian bicycle made from stainless steel. Stainless is expensive, and the amount of time and labor required to bring it to a mirror finish was ridiculous, but the final product is so striking that I believe it was worth it. I hope you agree. I would like to see the same style bicycle, or something worthy of commuting, made from stainless steel and with a brushed finish. Everything Shiny! Polished StemAnother reason I built this bike was because I was invited by the Portland Art Museum to display a couple of bicycles along with the Cyclepedia exhibit this past summer, 2013. It was an honor to be invited, and I wanted to make something that I believed was worthy of being shown in such a prestigeous museum. Here above is the photo series from my flickr site. There are a few repeats, but I chose to use them all, because each of them looks so good. Photo credit goes to Anthony Bareno. He took all these in the studio at Velo Cult. He said it was the most difficult bike he's ever shot. Too many reflections. If only there were some way to photograph this bike in the dark! Please check back in the future to get a full ride report. Aurelio CommuterThis is a bike that shipped to Aurelio just before the holidays. This one took a lot of hours, and a lot of weeks to complete. At base, it's a commuter bike, ready to do all the daily chores of getting around to work and to the store. But, it's a whole lot more than that besides. Take a look at the photos, and you'll see that it's all in the details.